King Mohammed VI of Morocco has underlined his countrys unflinching commitment to Africas peace and security under whatever circumstances. 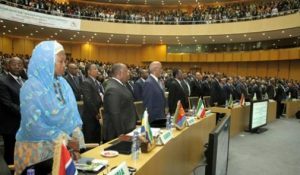 In a moving speech he delivered Tuesday before the heads of state attending the 28th summit of the African Union that massively endorsed Moroccos return within the continental organization the day before, King Mohammed VI pointed out that Moroccos ties with Africa have remained strong as far as security and peace are concerned. Morocco has also conducted a number of mediations, which helped achieve substantial progress towards peace, namely in Libya and the Mano River region, he said. Insisting that Africa is indispensable to Morocco and that Morocco is indispensable to Africa, the Monarch underlined that although Morocco withdrew from the Organization of African Unity, the predecessor of the African Union, in 1984, relations with the continent remained strong and even significantly developed. Since 2000, Morocco has signed nearly a thousand agreements with African countries, in various fields of cooperation, compared to only 515 agreements between 1956 and 1999, the Sovereign said as an instance, recalling that during this period he, personally, was keen to give fresh impetus to this action, by making more visits to various African sub-regions. Furthermore, major strategic projects were set up during the Kings visits to these countries. He mentioned in this vein the Africa Atlantic Gas Pipeline project he launched with President Muhammadu Buhari, during his visit to Nigeria early last December. Part of the projects aimed at improving agricultural productivity and promoting food security and rural development in the continent, the King mentioned the fertilizer production plants that have been set up with both Ethiopia and Nigeria, as well as the initiative for the Adaptation of African Agriculture, or Triple A Initiative, which was promoted during the COP22 held in Marrakesh. He explained that this innovative and extremely concrete response to the common challenges posed by climate change is aimed at providing more significant funding for the Adaptation of small-scale African Agriculture; it will also support the structuring and acceleration of agricultural projects in Africa. These projects will benefit the continent as a whole, he said, as he explained that Moroccos vision of south-south cooperation in the continent falls in line with an approach underpinned by solidarity and humanism. In this regards, the King recalled Moroccos migration policy in favor of Sub-Saharan citizens, which enabled more than 25000 people to benefit from the first phase of a large-scale regularization campaign and thus integrate in the Moroccan society. Several leading international papers, including the Financial Time and the Wall Street Journal, commented on Moroccos historic readmission to the African Union, describing the event as a landmark diplomatic victory that reflects the Kingdoms growing economic and political clout in the continent, where it has become a genuine player. Morocco has championed a substantive south-south cooperation approach in the continent, says the FT, while the WSJ considers the readmission of Morocco as a decision that adds powerful economy to the African Union.